Charles Taylor Jr. : Surf Boating at Waikiki, 1898. George W. Jacobs & Co., Philadelphia, 1898. "Colonel McF" is McFarlane was a prominant citizen and an enthusiastic promoter of outrigger canoe surfing in the mid 1890s. Our destination is the noted Waikiki Beach, three miles distant. We leave our unpleasantly rolling and rocking vehicle gladly, to wander along the beach. Here we find bath-houses, so, donning the suit usually worn by the men, a pair of swimming trunks, I plunge into the ocean, and enjoy the mild temperature and fine surf. The reef, about two miles seaward, protects this inland bay, where the swimmer may enjoy a frolic with old Neptune unmolested by the thousands of carnivorous sharks which inhabit these waters. Many thrilling stories are told of the experiences of the natives with these dreaded fish. and it is always the Kanaka who kills his enemy. Surf boating is one of the many pleasures afforded by the sea, to resident as well as native. Through the kindness of my good friend, Colonel McF , I am invited to join in one of these novel sports. Our party, consisting of my friend, three native Kanakas, and myself, dressed in bathing costume, and each provided with a paddle, row out to the reef, where the waves are high and powerful. Here we await one unusually large and strong. one appears, and we hear it hissing in our ears, with its white crest close upon us, we begin to paddle all together towards the shore ; as soon as the wave strikes the canoe we are carried with great speed upon its crest, at the rate of fully a mile a minute. We reach the beach alive and unharmed. This is a very exciting and sometimes dangerous amusement, for, while the canoe cannot sink, it often capsizes, throwing its occupants into the water, where the force of the waves is so great as to render swimming a hazardous experiment. The sport is repeated many times until fatigue ends our enjoyment. One day while sitting on the beach reveling in the beauty of picturesque Diamond Head, and the tropical plants and trees that fringe the shore, I observe a party, consisting of two young girls and a very old woman, each carrying a salt sack carelessly at her side, enter the water, and swim at least half a mile seaward. Then they dive, and remain a long time under water. I time some of these dives, and perceive that fully two minutes elapse before they return to the surface. They are gathering sea moss, and having filled their bags, swim ashore with the precious load. This moss is eaten by the Kanakas, and is quite palatable. The old woman is at least ninety years of age, and an athlete in strength. 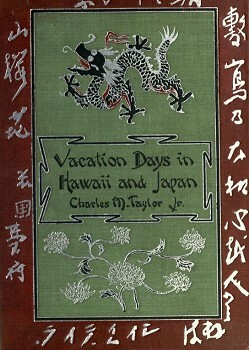 Geoff Cater (2012) : Charle Taylor Jr. : Vacation Days in Hawaii and Japan, 1898.